Take Current Affairs quiz March 22, 2019 to enhance your General Awareness. Practice with our esteemed Current Affairs quiz March 22, 2019 questions which covers all important events across India as well as World. Make use of all important Current Affairs quiz March 22, 2019 questions with answers updated here, at free of cost to succeed in all competitive Exams and Interviews. Which of the following Forest Ordinance Bill has been passed by Lok Sabha? The Lok Sabha passed Indian Forest (Amendment) Bill, 2017. The bill replaces Indian Forest (Amendment) Ordinance, 2017 promulgated by President Ram Nath Kovind in November 2017 and amends Indian Forest Act, 1927. Which of the following crop-damaging worms are spreading in Asia? The Food and Agriculture Organization (FAO) has expressed concerns over the increasing menace of the Crop-damaging armyworms in Asia. Which of the following is the joint military exercise between India and Sri Lanka? India and Sri Lanka is to conduct joint military exercise Mitra Shakti VI from 26 March to 8 April at Sri Lanka. Which of the following Indian-origin politician created history in the House of Commons of Canada as the first non-white leader of a major opposition party in the country? Indian-origin Jagmeet Singh made history in the House of Commons, a component of Canada’s Parliament, as the first non-white leader of a major opposition party in the country. What is the theme for World Water Day 2019? The World Water Day designated by the United Nations is celebrated on 22nd March every year. The theme for World Water Day 2019 is ‘Leaving no one behind’. 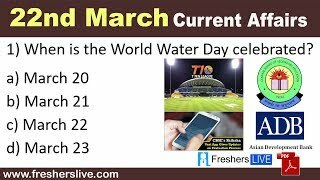 When is the World Water Day celebrated? The World Water Day designated by the United Nations is celebrated on 22nd March every year. How many Indian Olympic Association members have been recently named in various Standing Committees of the Olympic Council of Asia (OCA)? A total of 13 Indian Olympic Association members, including former India hockey captain Sardar Singh, have been named in various Standing Committees of the Olympic Council of Asia at its 38th General Assembly in Bangkok. When is the World Down Syndrome Day celebrated? Since 2012 ‘World Down Syndrome Day’ has been observed annually on 21st March. World Down Syndrome Day 2019 theme is ‘Leave no one behind’. Which of the following stadium will be the new home of T10 cricket for the next five years? Zayed Cricket Stadium, Abu Dhabi, will be the new home of T10 cricket for the next five years, starting with the 2019 season. Asian Development Bank (ADB) has inked an agreement to invest USD ___________ in Avaada Energy Pvt Ltd, for expansion of solar projects in India. The Asian Development Bank (ADB) will invest $50 million in Indian renewable energy independent power producer Avaada Energy Private Limited, to expand its solar energy generation capacity in India. First ever High-Level Dialogue on Indo-Pacific Cooperation (HLD-IPC) held in --------? First ever High-Level Dialogue on Indo-Pacific Cooperation (HLD-IPC) held in Jakarta, Indonesia. Which of the following is the India's deepest shaft cave, which has been discovered in Meghalaya? India's deepest shaft cave Krem Um Ladaw has been discovered in Meghalaya's East Khasi Hills district during the annual 'Caving in the Abode of the Clouds Expedition'. The cave has a 105 m deep shaft entrance passage. Are you looking for right place to enhance your Knowledge on Current Affairs of 22nd March 2019 through effective Quiz section? FreshersLive grants you the advantageous Current Affairs Quiz questions with accurate answers for 22nd March 2019 which covers all the important events, supreme Awards, major occurrences in the National as well as World level. All important Current Affairs Quiz questions of 22nd March 2019 are updated instantly in this page. Everyday at least 25+ Current Affairs Quiz Questions are displayed in this FreshersLive page. Correct Answer for each quiz question is given at the end of the entire 22nd March 2019 Current Affairs Quiz questions section. You can estimate and upgrade your GK by attending these useful quiz questions. Entire quiz questions of 22nd March 2019 Current Affairs covers Competitive Exam as well as Interview point of essentially important topics like International News, National News (ie. Indian Affairs), Science & Technology News, Environmental News, Bills & Acts Passed by Government, Defence News, About important Persons, Places, Banking & Economical News, Awards & Honours, Sports News, Revolutionary Updates on Arts & Culture, Obituary, Summits & Conference, Important Committee, Schemes, Appointments, Important Days & its Theme for Current as well as upcoming Year, Books & Its Authors, Agreements & MoUs, Budget, Taxes, Various Important Lists & Indexes, Visits by World Presidents, Prime Ministers, Political affairs and all Current Events. 22nd March 2019 Current Affairs Quiz Questions updated in this page are prepared in the sense to help all aspirants to succeed in various Competitive Exams like UPSC IAS and other Civil Services Examination, Various Bank exams like IBPS PO, IBPS Clerk, SBI PO, SBI Clerk, RRB PO, RRB Assistant, Insurance exams like LIC AAO, UIIC Assistant, Railway Exams, Various Central Government Exams like SSC CGL, SSC CHSL, and more. Attempt all the Current Affairs Quiz Questions of 22nd March 2019 and evaluate your score by matching your response with the correct answers mentioned at the end of this quiz questions section. By practising the FreshersLive Current Affairs Quiz Questions on a daily basis, you can surely succeed in the competitive exams as well as the interviews easily. Make use of this ultimate resource to the fullest and quickly achieve your goal!